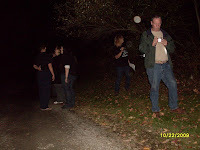 On Sep 6, 2006, I was at Mr. Floyd's, taking pictures and have 3 EVP sessions. 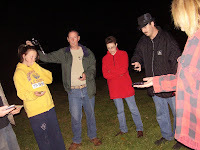 The first two sessions and all of the pics gave up nothing to explain the third EVP session that scared me worse than any other EVP I have ever gotten. I contacted several other ghost hunters at that time, and searched for an answer to the reason for a horrible sounding ghost that hissed he was going to get me and he couldn't wait. One of the stories I got was a theory about Mr. Floyd and his ghost. It would seem that as Oct 22 nears each year, Mr. Floyd becomes more and more insane. Finally, on Oct 22 he relives his death over and over, and he is at his most violent. Made perfect sense to hear it. I wanted to find out. After getting permission from the Park service, my crew and I set up for a 6 hour investigation. Under a Canopy, we put our equipment out, some snacks , and some general info about the area. I invited some people to come along with me as well as my team. We divided the area into 5 sections and put 5 teams out there to search for any sign that Mr. Floyd was around. We searched the parking lot across the street, the woods, the site near the sign, the area of the barn, and the possible site that Mr. Floyd actually died. If you scroll to the bottom, there is a map of the area from a 1934 Review Newspaper that we based the locations on. 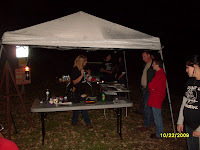 Our special guest ghost hunters for the evening were Steve and Tammy Smith. 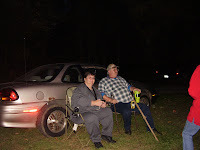 They could not stay for the entire event, but Tammy did bring out her laptop computer, showing us pictures and using it to play some great EVP they had gotten from some of their cases. Thanks Steve and Tammy for your help. 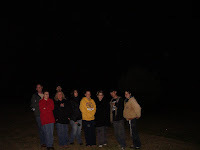 We took many pictures and had 17 EVP sessions. We were joined by some other special guests as well. In this photo is Will (in the black coat), a regular attender of the many tours and events Ghosting 12 has had this year. We hope to invite him to many more. He bought his own Olympus recorder and has a great camera. He has sent in pictures I have posted on the blog before from Thompson Park. The Lady In Red is Mary Ann, Dave's wife. This is us up near the little air port. 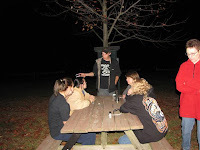 We did several EVP sessions sitting at this picnic table. The weather was so nice, I personally could have stayed out there all night. Everything was calm and comfortable. 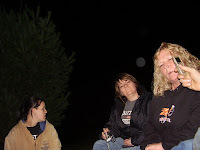 This is Cindy and Becky at the site in the field we estimated that Mr. Floyd may have died. Like Will, Becky has come to nearly every event we have had since May. 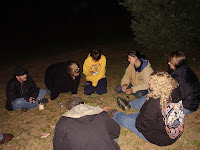 We stood to do EVP, sat at the Picnic table and even sat on the ground. We were polite. We provoked. We even offered food in the form of a Pop Tart. 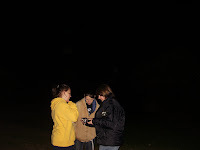 Here, Becky, Sammi, and Amber listen to an EVP session they did together. Nothing was on it. In fact, nothing was on anything. There was no outstanding pictures. Not a peep on the EVPs we did anywhere. If Mr. Floyd relives his death over and over, he did it very quietly. If he gets more violent, he did it somewhere else. After nearly 6 hours of investigating, we got nothing. On the 75th anniversary of his death, he was actually pretty calm about it. In fact, I would say he wasn't even there. Does that mean the area is not haunted? No. It just means that the story I heard about his reaction to the anniversary of death is not true, or so I believe. I knew Mr. Floyd was not like that. Now, the crazy guy(a man who committed suicide up there around 2003) is another story, literally. FAIRVIEW FRIDAY IS ALMOST HERE!!! !